The Sachs Covered Bridge, also known as Sauck's Covered Bridge and Waterworks Covered Bridge, is a 100-foot, Town truss covered bridge over Marsh Creek in Adams County, Pennsylvania. 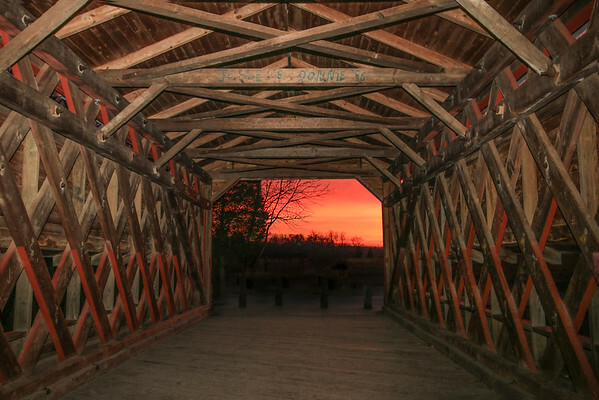 The bridge was also known as the Sauches Covered Bridge at the time of the Battle of Gettysburg. During the American Civil War, both the Union and Confederate Armies used the bridge in the Battle of Gettysburg and its aftermath. The Sachs Covered Bridge was built around 1854 at a cost of $1,544 and was designated Pennsylvania's "most historic bridge" in 1938. After a plan in 1960 to replace the bridge, the Cumberland Township officials voted to close the bridge to vehicular traffic, while leaving it open to pedestrians, on May 9, 1968. It was listed on the National Register of Historic Places on August 25, 1980.